A missile fired by Hezbollah, not an unmanned drone laden with explosives, heavily damaged an Israeli warship off Lebanon, the army said Saturday. The attack on Friday night had raised widespread concern in the Israeli military because initial information indicated that the guerrillas had used a drone for the first time to attack Israeli forces. But as Israelis reportedly recovered two of the bodies of the four Israeli sailors left missing in the attack, the army's investigation showed that it was a missile fired from the shore of Lebanon that hit the vessel. During the same attack a civilian merchant ship was hit by a Hezbollah rocket, the Israeli army said. It did not give the nationality of the vessel or say whether there were casualties. "You wanted an open war and we are ready for an open war," Hezbollah leader Sheik Hassan Nasrallah said in a taped statement. He vowed to strike even deeper into Israel with rockets. Nasrallah's supporters watched the speech in a school where they took shelter from the bombing and they were delighted with his calls to arms, reports CBS News correspondent Elizabeth Palmer from Beirut. 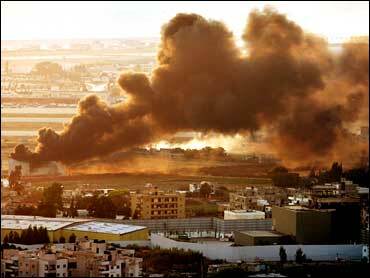 Israel again bombarded Lebanon's airport and main roads in the most intensive offensive against the country in 24 years. For the first time it struck the crowded Shiite neighborhood of south Beirut around Hezbollah's headquarters, toppling overpasses and sheering facades off apartment buildings. Concrete from balconies smashed into parked cars, and car alarms set off by the blasts blared for hours. The toll in three days of clashes rose to 73 killed in Lebanon and at least 12 Israelis, as international alarm grew over the fighting and oil prices rose to above $78 a barrel. The U.N. Security Council held an emergency session on the violence, and Lebanon accused Israel of launching "a widespread barbaric aggression." In addition to the fighting in Lebanon, Israel pressed ahead with its offensive in the Gaza Strip against Hamas, striking the Palestinian economy ministry offices early Saturday. The Israeli warship, which had been carrying several dozen sailors, was towed to Haifa after suffering heavy damage. The fire was put out after several hours. The military confirmed news reports that four sailors were missing and said a search for them was under way. The Israeli army said the source of the attack was still under investigation. But military officials, speaking on condition of anonymity because of the probe, said the ship had been targeted by an unmanned drone. The explanation indicated Hezbollah has added a new weapon to the arsenal of rockets and mortars it has used against Israel. Hezbollah reconnaissance drones have entered Israeli airspace twice in recent years. In those instances, Israel accused Iran of providing the drone technology to the guerrilla group. Despite fears the assault could bring down the Western-backed, anti-Syrian government of Lebanon, Israeli Prime Minister Ehud Olmert vowed the campaign would continue until Hezbollah guerrillas, who are backed by Syria and Iran, lose their near-control of southern Lebanon bordering Israel. Olmert agreed in a phone call with U.N. chief Kofi Annan to allow U.N. mediation for a cease-fire - but only if the terms include the disarming of Hezbollah and the return of two Israeli soldiers whose capture by the Muslim guerrillas Wednesday triggered the fighting. Hezbollah rained dozens of rockets on towns in northern Israel. One rocket hit a home in Meron, killing a woman and her grandson. Some 500,000 Israelis were ordered to stay indoors and away from windows Friday night as a precaution against the rocket fire. Residents in northern border communities were ordered to sleep in bomb shelters, which are found in virtually every Israeli home and apartment building. Nasrallah was not hurt after the Israeli missiles demolished his headquarters - two buildings in Beirut's southern neighborhoods, the militant group said. Three people died in the airstrikes. The attack on the warship was apparently timed to coincide with Nasrallah's message on the militant group's television station. "The surprises that I have promised you will start now. Now in the middle of the sea, facing Beirut, the Israeli warship ... look at it burning," Nasrallah boasted. President Bush, who has backed Israel's right to defend itself, spoke by phone with Lebanese Prime Minister Fuad Saniora from a G-8 summit in Russia and "reiterated his position" that the Israeli attacks should limit any impact on civilians, White House spokesman Tony Snow said. But the promise fell short of the Lebanese leader's request for pressure for a cease-fire. Israel's campaign appeared to have a two-pronged goal. One was to batter Hezbollah and end its near control of the south on Israel's borders. "We know it's going to be a long and continuous campaign and operation, but it's very clear. We need to put Hezbollah out of business," Brig. Gen. Ido Nehushtan told The Associated Press. Israel's army chief, Lt. Gen. Dan Halutz, said Hezbollah has rockets that can reach at least 40 miles, which would bring more Israeli cities, such as Hadera, within range. The other goal was to seal off Lebanon by repeatedly striking its airport and main roads - including the coastal highway from north to south and the Beirut-Damascus highway, Lebanon's main land link to the outside world. At the same time, Israel was gradually escalating the damage to the country's infrastructure, painstakingly rebuilt since the civil war ended in 1990. Israel holds Lebanon responsible for the capture of its two soldiers in a surprise Hezbollah raid; the Lebanese government insists it had nothing to do with the attack. However, Israel wants it to rein in the guerrillas, a move Lebanon has long resisted. The level of damage inflicted by Israel appeared finely calibrated. For example, a missile punched a hole in a major suspension bridge on the Beirut-Damascus road but did not destroy it, unlike less expensive bridges on the road that were brought down. An Israeli strike hit fuel depots at one of Beirut's two power stations - sending massive fireballs and smoke into the sky - but avoided the station itself. Throughout the morning, Israeli fighter-bombers pounded runways at Beirut's airport for a second day, apparently trying to ensure its closure after the Lebanese national carrier, Middle East Airlines, managed to evacuate its last five planes to Jordan. One bomb hit close to the terminal building. Civilian casualties were mounting faster than during Israel's last major offensive in Lebanon, in 1996, an assault also sparked by Hezbollah attacks. In that campaign, 165 people were killed over 17 days, including 100 in the shelling of a U.N. base. "We are on the right and we shall avenge every attack we endure," said Fadi Haidar, an American-Lebanese who swept up the shattered glass outside his store in south Beirut. "I have huge debts and now my store is damaged. ... But as time goes by, they will all realize that Sayyed Nasrallah is right and is working in the interest of Muslims." Meanwhile, the U.S. government told Americans in Lebanon to consider leaving when it is safe, and said it was making plans for the evacuation of people who cannot leave on their own. The State Department estimates there are 25,000 U.S. citizens who work or live in Lebanon.